Band formed in 2008 from members of the Knoxville Scottish Music Club. They play a wide variety of Scottish tune styles in the form of jigs, reels, strathspeys, hornpipes, marches, waltzes, and lovely slow airs. The band is comprised of four musicians: fiddles and guitar often changing up the sounds with penny whistle, bodhràn, mandolin, vocals, and occasional step dancing. 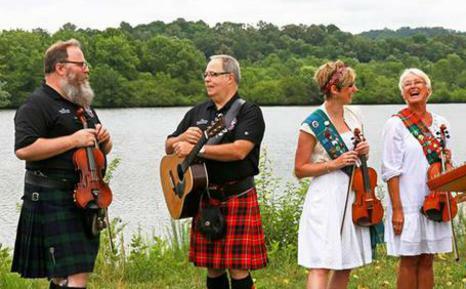 This group shares their love of Scottish music and performs repertoire that illustrates the shared influences from the old time traditional music often enjoyed in Appalachia and beyond. ​Michael Dodge - fiddle/ He is a native of Nova Scotia and brings this style of fiddle music to the band. ​Alicia Luttrell- fiddle, whistles, bodhràn, dancing/ She is a native of Maryvile, TN and has played violin/fiddle since 1985. David Pickens- guitar and MC is the leader of the Scottish session at Boyd's Jig and Reel.